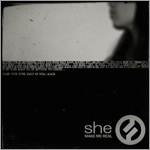 she – Official website » Blog Archive » New Single: Make Me Real is Available now. New Single: Make Me Real is Available now. The new single Make Me Real is available on iTunes, Amazon MP3 and other online stores. The song explores themes of isolation, dreams and hopes. It’s a love story set in between and during lucid dreaming when the dreamer is aware of the dream and tries to take control over it. The Single is available as a free download and includes a b-side song “Insomnia”, first part of the insomnia series. Release page with credits can be viewed here.